Families continually ask, "Where can we go on a Cabo family vacation where our kids can swim at the beach?" Up until now, those family beach vacation options have been severely limited. The opening of the Casa Dorada Los Cabos, Resort & Spa has changed all that, bringing family-friendly luxury vacation accommodations to the heart of Medano Beach in downtown Cabo San Lucas. For many families, a beach for swimming is a family vacation necessity. Casa Dorada's location on lovely Medano Beach fits those needs perfectly. The resort sits on five prime beachfront acres on Medano Bay, overlooking the brilliant blue Sea of Cortez and Land's End's spectacular rock formations. The beach here stretches for miles and a roped-off swimming area in front of Casa Dorada protects the kids from boats and personal watercraft. Plenty of lounge chairs and umbrellas are available. The resort's beachfront Maydan Beach Club restaurant keeps families happy with its variety of convenient lunch offerings, snacks, and a kid's menu. Casa Dorada's spacious suite accommodations provide lots of family room. 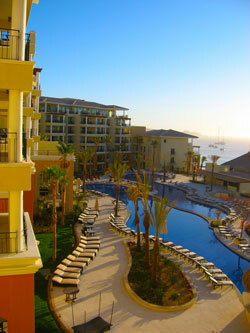 The resort has 186 deluxe oceanview rooms and suites, including 13 penthouse suites facing Cabo's famous Land's End area. The resort's suite accommodations range from approximately 900 to 4,200 square feet and are decorated in an elegant contemporary style. All feature large closets with plenty of storage space, a living room, dining room, a kitchen or kitchenette, plasma screen satellite televisions, complimentary wireless Internet, a Jacuzzi, and marble bathrooms. All of the rooms have either a terrace or balcony, allowing parents to relax and enjoy the views while their children nap in the afternoons or evenings. The 1,869 square-foot two bedroom suites are particularly nice for large families, with their exceptionally expansive living and dining rooms, full kitchen, and two roomy bedrooms. The master bedroom has a king bed, a lounging chair, a flat screen television, and a decadent two-person Jacuzzi tub. The second bedroom, located on the other side of the suite, has two double beds. The living room has a pullout sleep sofa, allowing the unit to accommodate eight people. These are some of the nicest two bedroom suites I've seen in the Los Cabos area. Casa Dorada's one bedroom suites also work well for families, with almost 1,400 square-feet of space, a king bedded master bedroom with Jacuzzi, and a pullout sleep sofa for the kids in the living room. For the best views, request higher floors (5 and above) and room numbers ending with 20-29 when booking rooms. All rooms At Casa Dorada are just steps away from the pools and the beach, making vacations even easier for families with young children. As a Preferred Hotels & Resorts member, one would expect Casa Dorada to provide a number of luxury amenities for its discerning guests. The resort's 7,000 square-foot Saltwater Spa offers guests the opportunity to try some unusual spa treatments such as the Couleur de Vie, a treatment that combines color therapy, aromatherapy and thalassotherapy. A full menu of salon services, facials, massages, exfoliations and other treatments are available as well. Cold plunge pools, sauna, steam room and Jacuzzis encourage guests to linger long after their treatments are completed. With its state-of-the-art Precor equipment and iPod docking stations, the spa's fitness studio will also allow parents and teens to stay in shape on their vacation. Families will enjoy the resort's three swimming pools, including a children's pool and water fun area. Another special amenity for families is the resort’s Casa Kidz Playzone, a free children's activity program for young guests between 4-11 years of age. Casa Kidz is open from 9 a.m. to 9 p.m. daily and capacity is limited to 20 children. Activities include ceramic painting, handicrafts, building sand castles, treasure hunts, pool time, games, and watching movies. Lunch service is available for children at an extra charge. Parents are issued beepers when dropping off children at Casa Kidz and if necessary, must pick up children within 15 minutes of being paged. A babysitting service is also available for younger children, or if parents are planning to leave the resort during the day or in the evening. The downtown area of Cabo San Lucas is filled with a wide variety of dining options. For that reason, as well as its flair for the unique, Casa Dorada designed its restaurants to offer something memorable and different for its guests. The resort’s signature restaurant, 12 Tribes, presents guests with a choice of delicious dishes and flavors from around the world. The sunsets and spectacular sea views from this open air restaurant are not to be missed. Incredible sea views are also available from the Maydan beachfront restaurant, where international breakfast buffets and lunches are also served. The Okianus poolside restaurant and bar are also available for those who cannot tear themselves away from the pool. In the evening, parents will want to check out the B lounge with its 50 different beers, including a custom mango-flavored brew. The wide variety of things to do in Cabo helps to make it a great vacation destination, and the Casa Dorada Los Cabos is right in the center of it all. With its many golf course venues, Los Cabos area is known as the “Pebble Beach of Mexico.” Guests at Casa Dorada enjoy discounted greens fees at the 18-hole Robert Trent Jones II designed Cabo Real golf course, one of the premier courses in the area. The golf course has been the site of two Senior Slams and other prestigious tournaments. The course has nine oceanfront holes and features a variety of unique challenges for golfers of all skill levels. 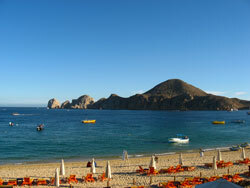 The Cabo area is also known for year-round fishing and whale-watching during the winter months. Charters are available from the marina, just a short walk away from the Casa Dorada resort. Shops and restaurants are located in that area as well. Adventure seekers can go on ATV tours, take scenic helicopter rides, or soar across deep canyon ravines on a zip line. Cabo’s Wild Canyon Adventure is the home of ten zip lines, including the longest one in Baja. Guests can ride in tandem or even up to four at a time on some of the sections, making this attraction particularly thrilling and unique. Speeds of up to 56 miles per hour may be reached on the longest zip line, which is more than half a mile in length and over 300 feet off the ground. All participants should be in good shape and must be able to walk up a 20 degree slope for at least 5 minutes without stopping, since there are a significant number of steps and uphill treks on this adventure. Heat can also be a factor, as there is little shade available. Equipment standards dictate a maximum weight of 250 pounds for all participants, and children should be at least 10 years of age to take part in all of the activities at Wild Canyon Adventure. For more information on the Casa Dorada Los Cabos, Resort & Spa or to make reservations, visit their website at www.casadorada.com, call 1-866-448-0151 from the United States or 1-866-711-4369 from Canada, or contact your favorite travel agent.